Up at 6am, drove over to Fox News (Fox40.com) for live interview. We should be able to get DVD from Slack Video Service 916 351 0424 (I left a message) or slackvideo.com Thursday evening the Towe Museum held a class for docents who will guide visitors through the museum at the end of their docent class, and Marcelo presented his slide show. Forty or fifty attendees will now know about solar cars. Mark and Elaine prepared a delicious dinner. Stayed another night at Elaine’s. We knew today was going to be a rainy day, but we ventured out early to meet fox 40 news. 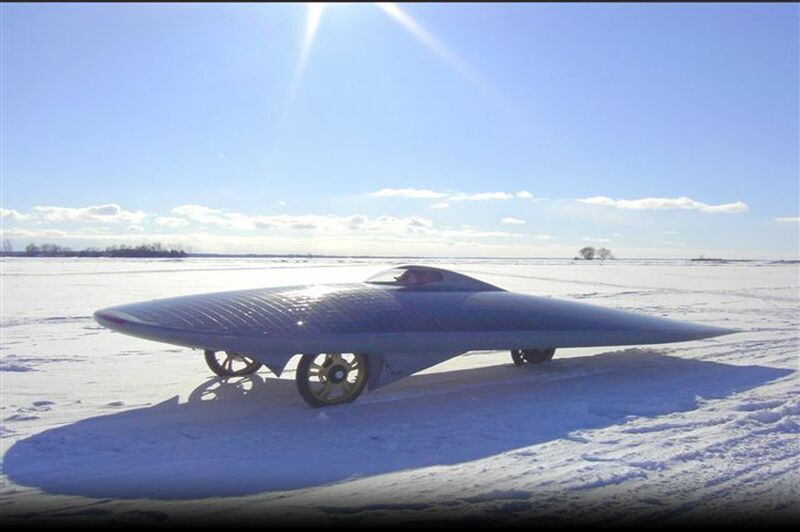 We eventually convinced them to do an interview outside because the solar car is the feature. Luckily the afternoon received some sunshine and we were able to array the solar car at the Towe Museum. Finally we have updated the website for all of you who have been begging. he could drive in a t-shirt since August. We were invited for lunch with the Towe volunteers. Some mechanical talk with Towe volunteers. Wenko (a new supporter tries to get us a sponsor) and Marcelo. Outside the classroom showing the solar car.